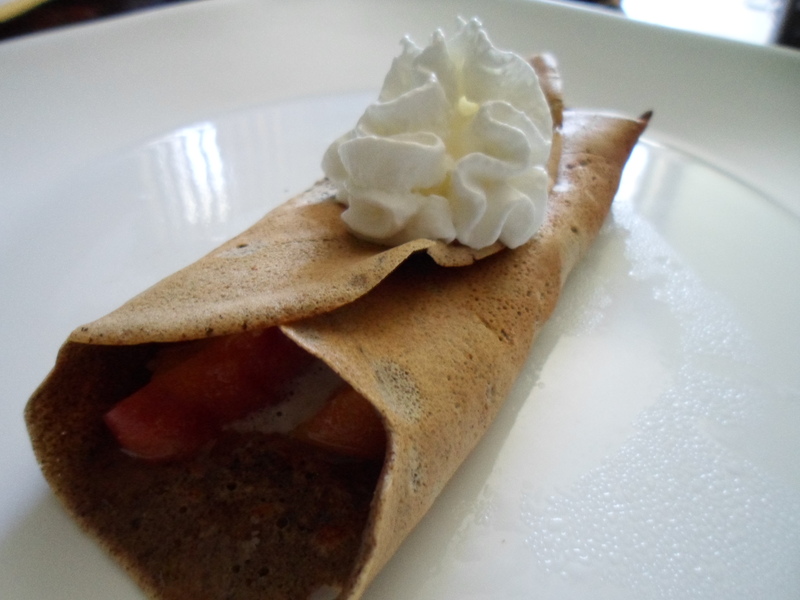 Buckwheat crepes are super easy to make and you can fill them with a variety of different things so you will never get bored. I like to freeze leftover crepes for a quick snack or an on the go breakfast when I need it. Pop one in the microwave for about 30 seconds, spread on some nut butter, roll it up, and ta dah! A healthy snack when you are on the run. 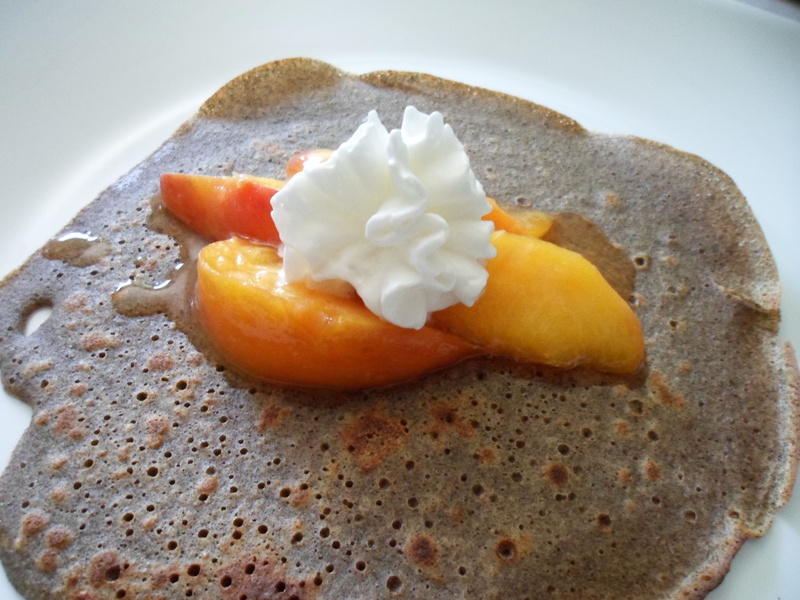 I love buckwheat, it has been my go to whole grain for making breakfast since I gave up wheat and oats (due to GI issues 🙁 ) I also have a buckwheat pancakes recipe and a savory buckwheat crepes recipe posted if you want to check out more ways to use buckwheat. Mix together flour, sugar and cinnamon in a large mixing bowl. Add eggs, milk, and vanilla extract. Mix until completely blended. Refrigerate batter for an hour or overnight (I prefer overnight). Heat a medium sautee pan over medium heat. Spray with cooking spray to prevent sticking. Mix batter and pour a little less than a quarter cup onto preheated pan. Tilt pan to spread batter thinly and evenly. Allow to cook for about 30 seconds or until edges start to brown and separate from pan. Flip and cook for about another 30 seconds. Remove from heat and place on plate to cool. Continue this process until all the batter is used. If freezing, place in a tightly sealed ziplock bag or tupperware after it is cool and place in freezer. 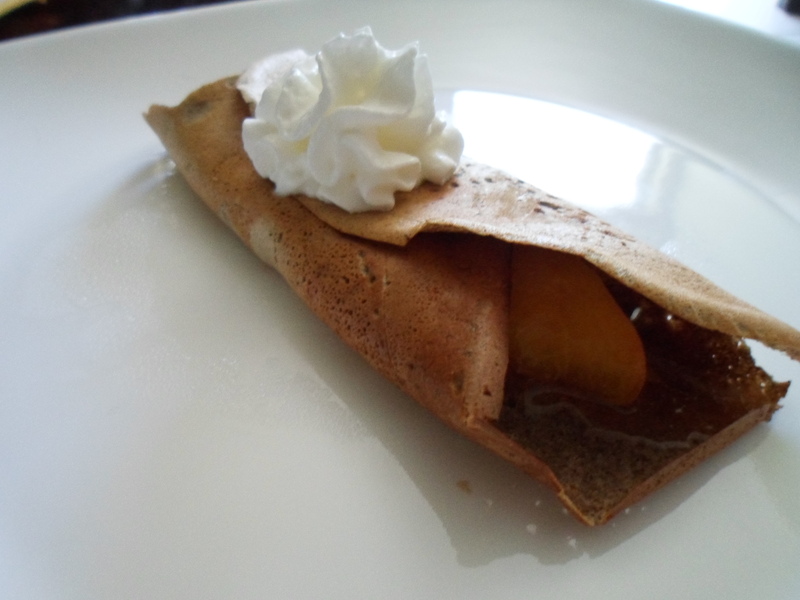 Mine did not stick together when frozen but if you are concerned about that you can separate crepes with wax or parchment paper. Clean and slice peaches, removing pits. Place in a saute pan with honey and cook on medium low until warm and soft. Approximately 5 minutes. Who said quiche has to have crust? To make up for the lack of crust, I added potatoes to my quiche to provide some healthy carbohydrates and extra nutrients such as potassium (good for your heart) and vitamin C (antioxidant, good for your skin). This recipe actually reminds me of a tortilla espanola due to the lack of crust and the addition of potatoes. However, unlike the tortilla espanola, this dish is baked in the oven like a quiche. Preheat oven to 350 degrees. Spray a 9″ glass pie pan with cooking spray. Add eggs and milk to a large mixing bowl and whisk together. Add salt, pepper, onion powder, oregano and basil to egg mixture and whisk until uniform. Evenly distribute spinach in the sprayed pie pan and layer potatoes on top. Sprinkle cheese over spinach and potatoes. Pour egg mixture into pie pan. Bake in oven for approximately 45 minutes or until quiche is set.